Igloo Products Corp., the number one cooler manufacturer worldwide, has updated its “Creatures” line of back to school lunch coolers to include three new characters/personalities. 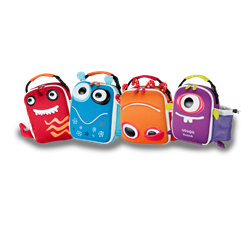 The line, which launched in 2013, is different from Igloo’s other back to schools products in that each lunch bag in the Creatures line is a character with a unique personality. The lunch coolers have molded EVA faces unique to each character, neoprene exteriors and “Creature Features” like arms, legs, tentacles or wings attached. “Each character is fun and different. Tango loves music, art and dance, while Oggli is a writer at heart and Razz is the athlete,” explained Poole. “Our hope is that each child will identify with their favorite Creature or fall in love with them all,” Poole continued. The lunch coolers have molded EVA faces unique to each character, neoprene exteriors and “Creature Features” like arms, legs, tentacles or wings attached. In addition, the bags feature a side water bottle pocket and carry handle with clip and snap bungee to attach to backpacks. As with all Igloo back to school products, the Creatures cooler bags have leak-resistant, easy to clean, anti-microbial liners. The updated Creatures line will be available at retail in July of 2015 and have an MSRP of $14.99. For further information about the Creatures line or about any other Igloo product, contact Katie Davis at kdavis(at)igloocorp(dot)com.